Can the impact of com­pli­ments be just as strong online as they are in person? The Student Activ­ities Board believes so. In an effort to promote a more pos­itive campus, SAB’s social media team res­ur­rected the “Hillsdale College Com­pli­ments” Facebook page of 2013, this time bringing it to Instagram. 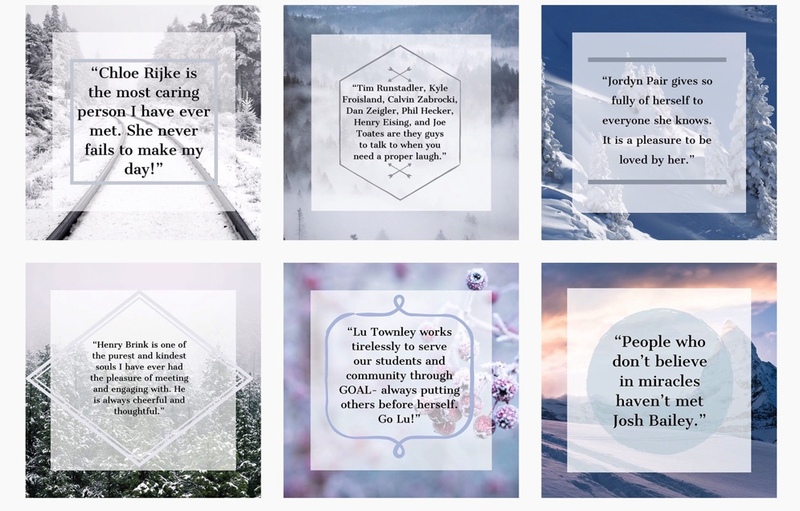 The Hillsdale College Com­ple­ments Instagram account posts brief, per­sonal com­pli­ments, sent in by stu­dents. Lauren Schlientz, a senior on SAB’s social media team, said the page is an easy way to com­pliment someone and to bring about pos­i­tivity. Stunned by the amount of com­pli­ments ini­tially received, Schlientz said stu­dents were quickly on board with the idea. “You have the oppor­tunity to make someone’s day, which I think is really cool,” Schlientz said. The account raises awareness of others’ admirable qual­ities, encour­aging stu­dents to focus less on them­selves and more on their peers, Schlientz said. The team filters out certain com­pli­ments, such as those that are pur­pose­fully teasing or provocative. After seeing an anonymous com­pliment to her, junior Frances Weise said it made her happy, and she told her friends to check the page out. Alexandra Whitford, assistant director of SAB, said that during her under­graduate years at Hillsdale College, stu­dents ran a Facebook group with a similar purpose, and posted quite fre­quently. The com­pli­ments grad­ually came to a stop in 2017. Rising as an unde­niable force, social media can yield both pos­itive and neg­ative effects. It can help people find com­mu­nities, yet it also fosters harm by allowing more freedom to cyber­bully through online anonymity. A few years ago, stu­dents on campus used a group mes­saging app called Yik Yak to place their peers in a neg­ative light by posting hurtful com­ments, Whitford said. Yik Yak launched in 2013 and ended in 2017, and was a space for local gossip within a 5 mile radius of account holders, termed “Yaks.” Users were unnamed, and this online invis­i­bility led to a great deal of wide­spread cyber­bul­lying. Weise appre­ciated the anonymous platform the new page pro­vides for stu­dents sending in com­pli­ments. “It’s nice to have that anonymous platform where you can feel com­fortable sharing, knowing no one will know it’s you,” said Weise. Schlientz said she hopes the page doesn’t stop people from com­pli­menting each other in person.